Outcasts United by Warren St. John was a book that I found to be a fairly interesting read, but may well have enjoyed more had I gotten the original rather than youth version available at the library. 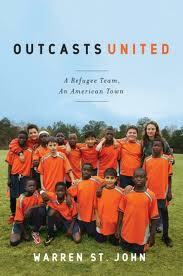 The full title of the book was Outcasts United: An American Town, a Refugee Team, and One Woman's Quest to Make a Difference and the story told was about Luma Mufleh and the youth soccer teams she put together and coached in Clarkson, Georgia. Written by St. John out of his Jan 2007 New York Times feature "Refugees Find Hostility and Hope on Soccer Field", the book dragged on for me a bit at times, but that was primarily during game recaps, and may well have been written differently in the original non-youth version. Regardless of the differences there may or may not be in the two book versions, the story is a great one and at a minimum, the Times story well worth a read.